Gene Simmons still has blood on his chin. After doing his best lizard impression, spewing fake scarlet liquid from his mouth onto his metal armor and then flying high into the air to rock out on a platform way above the stage, the famed bass player is back on the ground. He struts on his platform boots as if he’s walking around in the lightest Nike tennis shoes. Guitarists Paul Stanley and Tommy Thayer do so as well. They play hit after KISS hit, along with some deeper cuts. Then Simmons breathes a fire ball. 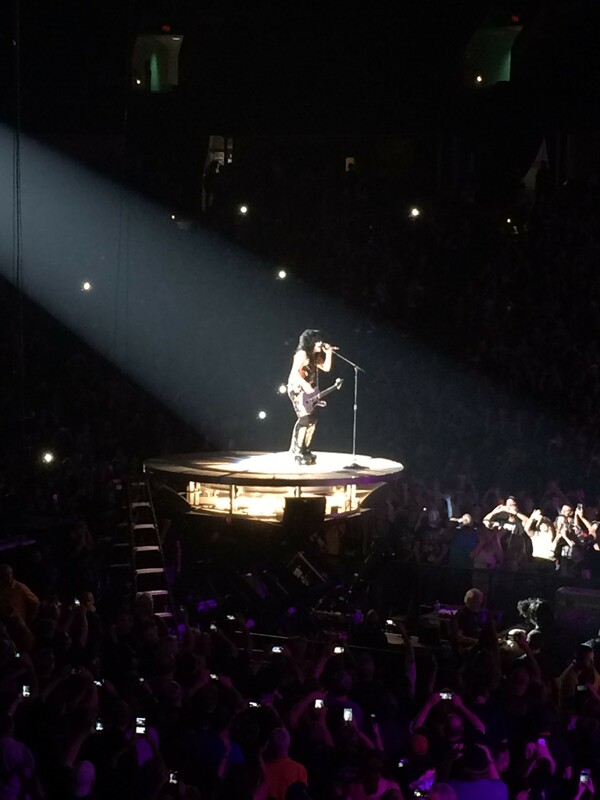 KISS co-founder Paul Stanley flew to middle of the arena to sing "Love Gun." He later asked, "Who wants to see my love gun?" Freedom to Rock tour stop at the Spokane Arena. It was huge and bombastic. Pyrotechnics went off nearly every song, because if you got them, you might as well use them. The very end of the show included lasers, fireworks, confetti, smoke, high-powered fans, streamers and, oh yeah, the musicians played “Rock and Roll All Nite” (two of them doing so while standing on swinging platforms that rotated over the audience). Of course, last week Simmons told the Inlander to expect the spectacle. He did not exaggerate. Throughout the night, Stanley, in a tone somewhat reminiscent of a nagging grandmother, introduces nearly every song. In the process he probably says the name Spokane more times on stage than any artist in history. He explains it’s an honor to play for us and that even though we weren’t the largest crowd (the upper level of the arena was completely closed off), we had the power to be the loudest. This is a band, together for more than 40 years, who’ve sold over 100 million records worldwide. They’ve played almost every stadium there is, including the smaller towns they hit up for this tour (they’re going to Bozeman tonight) and they know exactly what they’re doing. Sure, they may look silly — these men in their 50s and 60s still wearing makeup and strutting around like royalty. But the whole thing is supposed to be a little ridiculous. It’s about having (pretty family-friendly) fun. Currently, they can still play those awesome standards like “Creatures of the Night,” "Black Diamond" and “I Love it Loud”, so they’re not going to stop yet. Drummer Eric Singer has a beautiful voice and his rendition of KISS’s ballad “Beth” especially showed that off. For this number, they even let him come to the front of the stage. People took out their lighters, swayed and sang along. Oh, it was there — red, long and wild as ever. There was even a point where Simmons tried to lick Thayer with the thing, but luckily he was able to evade. KISS fan Dave Thormahlen was one of the few who was unafraid to go big. And then Stanley went super patriotic. He told the crowd that the military is what holds this country together. The audience started chanting “USA, USA, USA!” He told us the band was donating $150,000 to the Hiring Our Heroes foundation and then invited the Spokane Marine Corps Color Guard to come out and we all recited the Pledge of Allegiance. Then to top it off, KISS plays the “Star Spangled Banner” in glorious electric guitar harmony. “Patriotism is always cool,” Stanley said from the stage. Where were all of the costumes, people? There was only one group of guys who went full out, nearly tripping over their platforms. 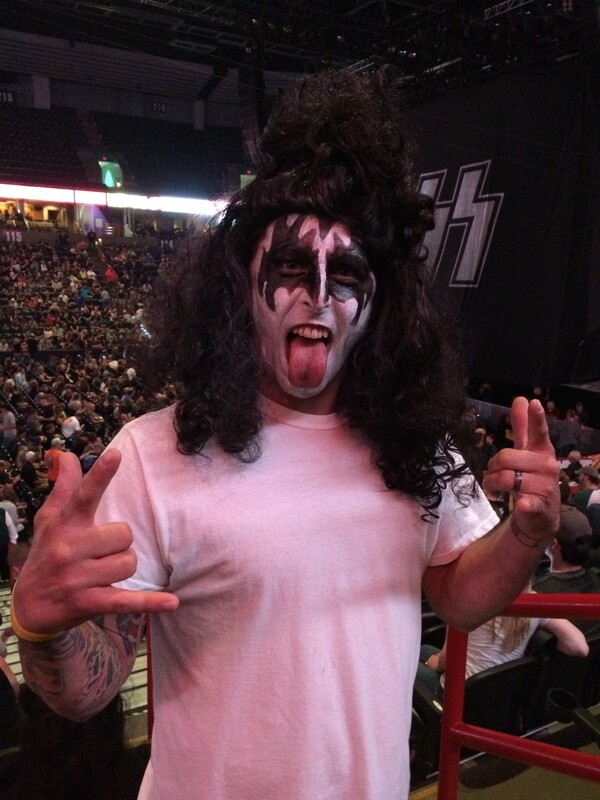 Other than that, between a few painted faces and wigs, people simply donned KISS T-shirts. I truly expected more. However, let it be known that the actual costumes worn by the guys on stage were impeccable, the detail brilliant. Their costume seamstress is a genius. Through all of the sweat, the spandex, horns and rhinestones held strong.